It’s already the weekend! That went by quickly. I did my weigh-in today and I lost 1.2 pounds this week! That’s 14.6 pounds in 8 weeks! That’s 1.82 pounds on average each week. I like it! 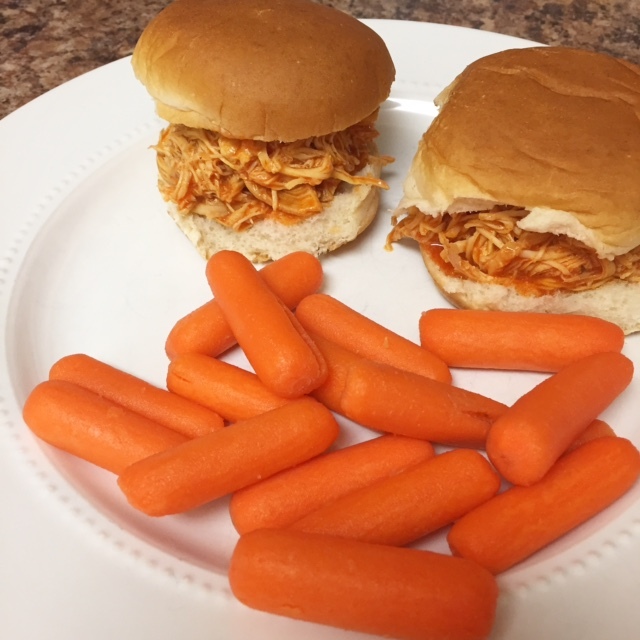 Last night, I made the Slow Cooker Buffalo Chicken from Emily Bites. It’s delicious! Definitely give it a try! I’m really enjoying her recipes. Next week is my birthday. Now I know some people hold fast to their diet, but my opinion is that on birthdays, calories don’t count. I don’t go crazy, but gosh darn it, it’s my birthday. I will enjoy it! Plus, if eating healthily is a lifestyle that I plan to keep up forever, I gotta splurge occasionally or I’ll go crazy. That’s just the way it is. Well, now I’m back on my regular schedule for weighing in. I had good results this week! Since last Friday (when I switched from Mondays to Fridays), I’ve lost 2.4 pounds! That’s a total of 13.4 pounds in six and a half weeks! Woohoo! I also did some quick measurements this morning, and found I’ve lost another inch in both my waist and hips. My “skinny” jeans are actually quite well-fitting now! I can just button, zip, and go! No more huffing and puffing and questioning my life choices anymore. Going grocery shopping tonight – excited to get some great food for next week! Ahem. Ladies and Gents… I have LOST TEN POUNDS!!!! I did my weigh in this morning and it said I had gained .6 pounds over the course of the week. I was a little disappointed, but I got it, because I did splurge some this weekend do to it being the beginning of the monthly week-from-hell where chocolate is the only thing that can convince you to get out of bed. But then I decided to weigh myself about an hour later, and I had LOST .6 pounds from last week. I don’t know why, and I’m not asking questions. I verified it a couple of times. I’ll take it. So my total loss is .6 pounds. I’m happy with that. I was not miserable this week, and I splurged, so I can’t expect more than that. Although if I had weighed myself yesterday I would have been an entire pound down, but whatever. I’m being honest and tracking my weight on Mondays. I am thinking of changing my date to Fridays though, because I’m so, so, so good during the week and it might motivate me to be better during the weekends. We’ll see. Tonight’s dinner is going to be the Rosemary-Swiss grilled cheese sandwiches. It was supposed to be last night’s dinner, but I forgot an ingredient – whoops! I’ll be posting the recipe tomorrow! Mondays are my weigh-in day, and today I saw some real results! I lost 4.4lbs since last Monday. Now that’s not 4.4lbs overall, because I gained 1.5lbs last Monday, remember, and that fell off pretty easily since I think I still had some of it inside me when I weighed myself Monday. But now I’m at 9 solid pounds lost since 7/20! I’m now able to wear some work clothes I wasn’t able to for a while, which is so nice. It’s like shopping in your own closet! I’ve figured out that I have to keep trying new recipes if I’m going to stick to this. It needs to keep being exciting, so I’m not tempted to just go to Popeyes around the corner and eat all of the chicken. Because I could eat all chicken at Popeyes. So yesterday, I made a pretty delish Weight Watchers recipe that I found. I would rate it a 8/10. 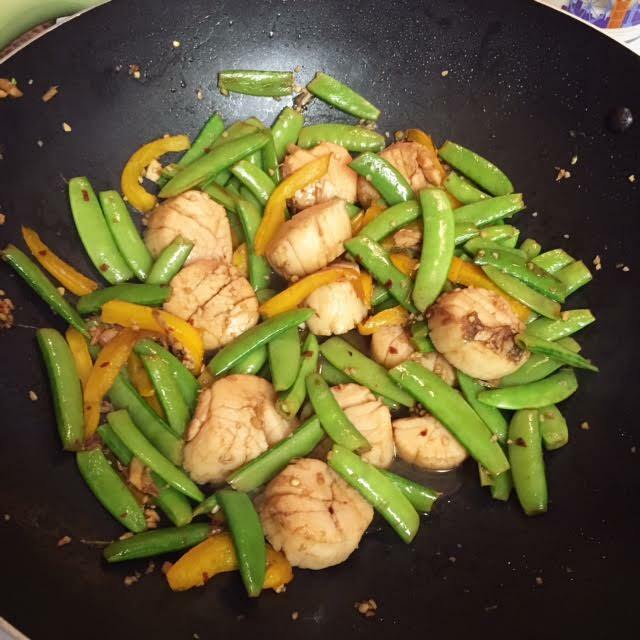 My husband said “It’s not in my top five, but you can definitely make this again.” I’ll post the recipe for Ginger Scallps & Snap Pea Stir Fry soon. So, I continue to be good, and I continue to not see results on the scale. I mean, I’m back to the lowest, but I’m bouncing around the same half pound or so, even though I continue to keep my calories between 1200-1400/day and stay under my allotted points. But I’m going to keep pushing, and eventually something will happen. I’m pretty proud that I’ve stuck to it so long. Yesterday, the Cowboys played their first preseason game, which brought me to the “what shall I eat during the game for one must eat!” problem. So, I had a very light snack at actual dinner time, and saved this for the game. 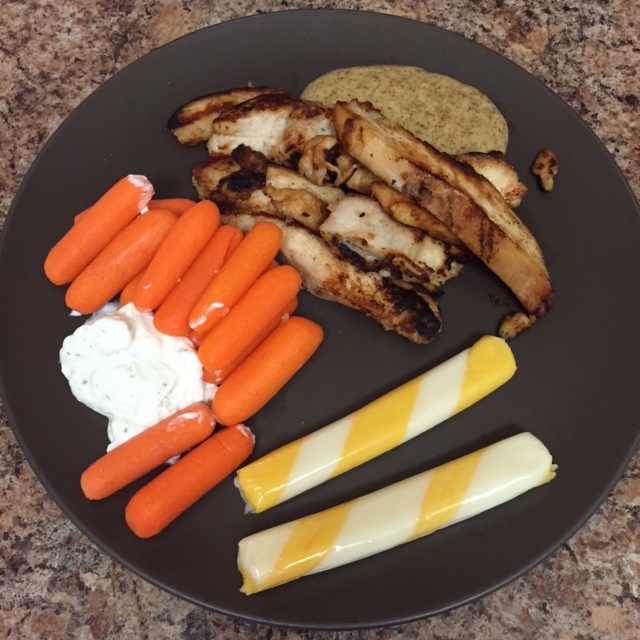 I added just a touch of honey to some mustard, and had a healthy dipping sauce! It appears that I do continue to see some off-the-scale results still though, regardless of my weight seeming to plateau. On July 9th (like a week before I started Weight Watchers), I measured myself. I had a 34.5″ waist, 45.5″ hips and 37″ chest. I measured myself again this morning [July 31], and had a 32 6/8″ waist, 43″ hips, and 36″ chest. That’s around 5 1/2″ lost so far! Today, I measured myself and I have a 32″ waist, 42″ hips, 35 6/8″ chest, and 29″ thighs. I was at 30 1/8″ for thighs on 7/31 and 30.5″ on 7/9. The biggest losses were on my waist and hips, 2.5″ and 3.5″ respectively. So all in all, so far I’ve lost 9.8″ in total! WOW! So a coworker of mine brings a couple of 34oz Deer Park bottles to work and chugs them throughout the day. She says it’s really helped with her not being hungry, etc., and my research online seems to corroborate that. I know I don’t drink enough. I drink my mug of coffee in the morning, mostly, and then sip on a vitamin water throughout the day. Then I’ll drink a glass of water at night. Not much at all! So I took the challenge and bought a couple of those bottles at the grocery store last weekend and tried it out yesterday. Holy cow. I’ve never peed so much in my life. I went to bed around midnight and woke up at 1:20am because my poor bladder couldn’t take it any more. Obviously I should have been hydrating more this whole time! But, this morning was the first day in several days that I’ve seen any downward movement on the scale. I still haven’t dropped any significant weight, but out of the 1.5lbs or so I’ve gained back, I lost about .5lbs of it again. I never realized how much thirst mimics hunger. I’m going to chug away! Ok, so I like it when this happens, and then I don’t. Part of me worries that it’s unhealthy, part of me says “hey you, this is how it should have been your whole life and would have been if you didn’t have a voracious swimmer’s appetite in high school.” I don’t know! But, I’m really struggling to eat enough points now suddenly. I’m not really… snacky, for some reason. Breakfast: hard-boiled egg, piece of toast, piece of ham. 5 points and 240 calories. Lunch: Hoagie with turkey, ham, and American cheese and a sugar-free jello. 12 points and 430 calories. Dinner: Pork loin with green beans. 3 points and 234 calories. Dessert: Weight Watchers English Toffee ice cream bar (SO GOOD). 3 points and 100 calories. I’m gonna throw in an apple and some Justin’s almond butter (6 points) because I’M 10 POINTS UNDER. WHAT IS THIS. The total points, apple and almond butter included, is 29 points (1250 calories). I still have 4 points left over at the end of the day. Since we need to eat our sandwich stuff and will have left over pork loin tomorrow, I’m in the same predicament tomorrow too. This feels super weird. I know you’re supposed to eat a minimum of 1200 calories a day, so that’s why I’m being sure to keep track of calories. My Fitness Pal says if I keep up at the pace I’m at right now, I’ll lose ten pounds by Labor Day. Sweet mercy!